A common slang usage of the word 'steam' means to be angry. A person who is 'steaming' is angry to the point of boiling over or losing their temper. They may need to 'blow off steam' in order to prevent that from happening. 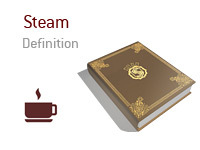 In the poker world, steam and steaming have similar meanings derived from that slang usage. Typically, a poker player who steams has been stuck and on tilt, and they develop a poor disposition because of that losing streak. Steaming isn't simply about anger, however, because a good poker player can channel frustration productively. To steam implies that the poker player is losing their discipline as well as being angry and perhaps even mean. A player who is steaming is often said to be "stuck and steaming." In poker, being stuck means being in the hole or on a losing streak. After all, players don't generally steam when they're on a winning streak and it's easy to be calm. All poker players can have a bad day and steam. It will happen to every player eventually, and when it does happen, usually the best course of action is to resign from the game as soon as it is polite and permissible to do so. Players who are prone to steaming possess a significant built-in disadvantage, especially if they play poker in an environment where they play against the same people. Opponents will learn this flaw and attempt to exploit it.